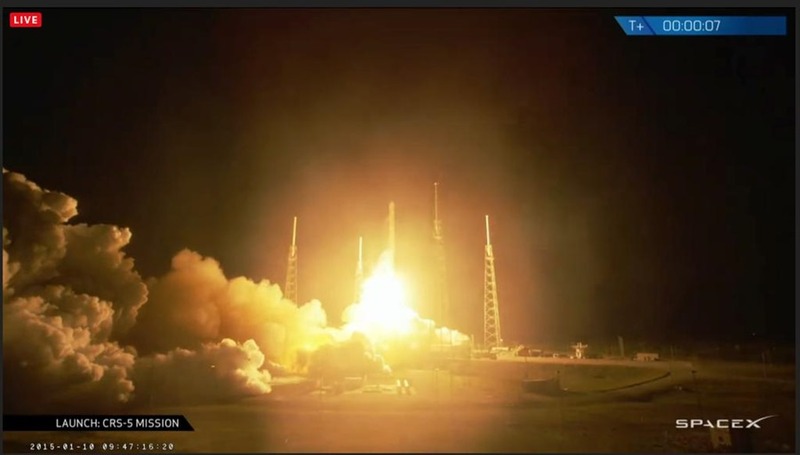 After five successful missions to the International Space Station, including four official resupply missions for NASA, SpaceX’s Falcon 9 rocket and Dragon spacecraft are set to liftoff from Launch Complex 40 at the Cape Canaveral Air Force Station, Florida. Their fifth official Commercial Resupply (CRS) mission to the orbiting lab. The launch just happened and is progressing well so far. 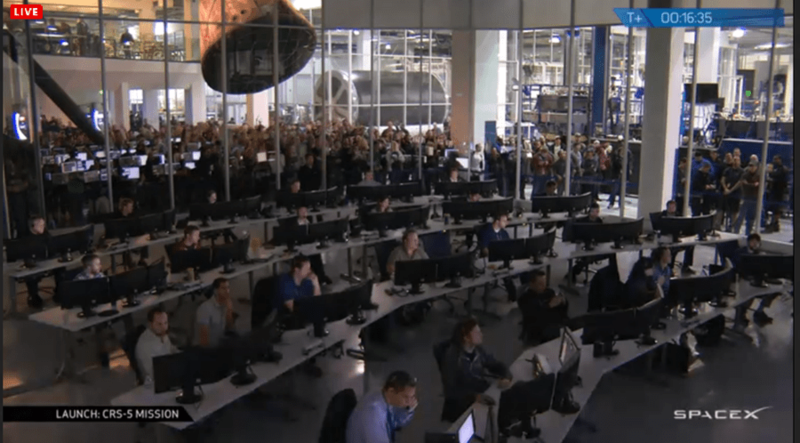 If all continues to go as planned, Dragon will arrive at the station approximately two days after liftoff. Dragon is expected to return to Earth four-and-a-half weeks later for a parachute-assisted splashdown off the coast of southern California. Dragon is the only operational spacecraft capable of returning a significant amount of supplies back to Earth, including experiments. Made in America. All of Falcon 9’s structures, engines, separation systems, ground systems, and most avionics were designed, manufactured, and tested in the United States by SpaceX. 21st-century rocket. As the first rocket completely developed in the 21st century, Falcon 9 was designed from the ground up for maximum reliability, achieving 100% of primary mission objectives on all flights to date. Designed for maximum reliability. Falcon 9 features a simple two- stage design to minimize the number of stage separations. (Historically, the main causes of launch failures have been stage separations and engine failures.) With nine engines on the first stage, Falcon 9 is capable of safely completing its mission even in the event of an engine shutdown. Statistics. Falcon 9 topped with Dragon is 207.8 feet (63.3 meters) tall and 12 feet in diameter. Its nine first-stage Merlin engines generate 1.3 million pounds of thrust at sea level, rising to 1.5 million pounds of thrust as Falcon 9 climbs out of the Earth’s atmosphere. In demand. SpaceX has nearly fifty missions on its manifest, with launches for both commercial and government clients. Designed to safely transport crew. Like the Dragon spacecraft, Falcon 9 was designed from the outset to transport crew to space. Mission success. Falcon 9 has achieved 100% primary mission success on its flights to date, including routine flights to the International Space Station and most recently the successful September 2014 launch of the CRS-4 mission. Why “Falcon”? Falcon 9 is named for the Millennium Falcon in the “Star Wars” movies. The number 9 refers to the nine Merlin engines that power Falcon 9’s first stage; one Merlin vacuum engine powers the second stage. As the launch continues, you’ll hear the flight controllers talking about different stages of the launch. Below is an explanation of what each stage involves. Falcon 9 tanks are made of aluminum-lithium alloy, a material made stronger and lighter than aluminum by the addition of lithium. Inside the two stages are two large tanks each capped with an aluminum dome, which store liquid oxygen and rocket-grade kerosene (RP-1) engine propellants. The tanks and domes are fabricated entirely in-house by SpaceX. Sections of aluminum are joined together using SpaceX’s custom-made friction stir welders to execute the strongest and most reliable welding technique available. The structures are painted in-house by SpaceX, concurrent with the welding process. Falcon 9’s first stage incorporates nine Merlin engines. After ignition, a hold-before-release system ensures that all engines are verified for full-thrust performance before the rocket is released for flight. Then, with thrust greater than five 747s at full power, the Merlin engines launch the rocket to space. Unlike airplanes, a rocket’s thrust actually increases with altitude. Falcon 9 generates just over 1.3 million pounds of thrust at sea level but gets up to 1.5 million pounds of thrust in the vacuum of space. The first stage engines are gradually throttled near the end of first-stage flight to limit launch vehicle acceleration as the rocket’s mass decreases with the burning of fuel. The interstage, which connects the first and second stages, is a composite structure made of sheets of carbon fiber and an aluminum honeycomb core, and it holds the release and separation system. Falcon 9 uses an all-pneumatic stage separation system for low-shock, highly reliable separation that can be tested on the ground, unlike pyrotechnic systems used on most launch vehicles. The second stage, powered by a single Merlin vacuum engine, delivers Falcon 9’s payload to the desired orbit. The second stage engine ignites a few seconds after stage separation, and can be restarted multiple times to place multiple payloads into different orbits. Like the first stage, the second stage is made from a high-strength aluminum-lithium alloy, using most of the same tooling, materials, and manufacturing techniques. This commonality yields significant design and manufacturing efficiencies.